Windmill Animal Hospital is AAHA Accredited! Windmill Animal Hospital is now an accredited member of the American Animal Hospital Association (AAHA). Update: 4/22/2017 - Today was the day for the AAHA (American Animal Hospital Association) inspection for Windmill Animal Hospital (recertification every 2 years) --we passed with flying colors!! Woo hoo!! We accrued more than 90% in each Standards category (and there are NINETEEN Categories!) Further good news: Windmill Animal Hospital was chosen as one of the practices to be used in the AAHA 2014 Benchmark Study looking at practice productivity and management, one of about 100 total practices chosen NATIONALLY. Double woo-hoo!! Heart-felt thanks to the FABULOUS Windmill team for working so hard on this! We couldn't do it without you! Is your vet AAHA certified? Only one other practice in the Big Country area can stand up to this type of strenuous test about staying truly "State of the Art"! Thank you to ALL of Big Country for helping make Windmill Animal Hospital Abilene's favorite place for top-notch family pet care! 4/26/2012 - We are proud to announce that Windmill Animal Hospital is now an AAHA accredited hospital (American Animal Hospital Association). 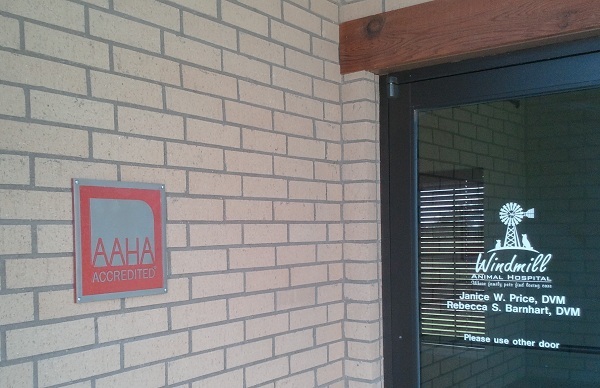 Very few veterinary hospitals can meet the stringent requirements of AAHA accreditation (there is only one other AAHA accredited hospital in the Big Country area at this time). AAHA requires a hospital to be open for 6 months before being eligible for accreditation; we were accredited at 6 months and 10 days! We are VERY PROUD of this accreditation, and very proud of our entire staff for working so hard to put our standards and protocols into place. Our AAHA accreditation demonstrates our commitment to the highest standards of veterinary care. AAHA regularly evaluates our hospital to ensure that we meet or exceed the association's standards for patient care, hospital services and equipment. AAHA standards are recognized around the world as the benchmark for quality care in veterinary medicine. Read all about AAHA accreditation, and what it means for your peace of mind for your pet's health care - and type in "79606" in the zip code search and "2 miles" to see Windmill Animal Hospital! this plaque for scoring so high on our inital accreditation inspection.